Though we had traveled in this area several times before, this was the first time we stayed in Cook Forest State Park. 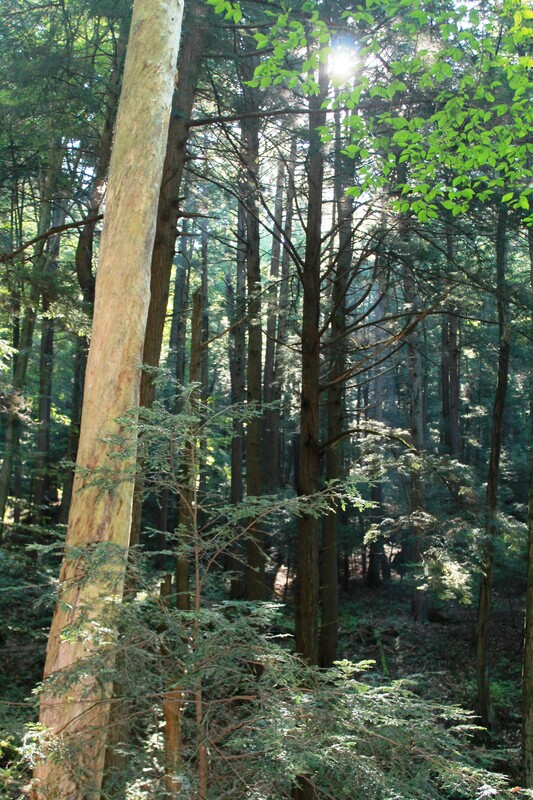 The 8500 acre Cook Forest State Park is off the beaten path in the Allegheny National Forest in scenic northwestern PA. Cook Forest is sometimes called the Black Forest and has extensive stands of old growth forest. The photogenic Clarion River connects Clear Creek State Park to Cook Forest State Park along a scenic ten mile stretch of river. Also in Cook Forest State Park is The Sawmill Art Center and Theater, several gifts shops, many restaurants, antiques, and local wineries. Our first two nights were spent at the Clarion River Suites. We first found this lodging on a trip in 1995 and always remembered the stunning views of the forest and surrounding area from 200 feet above the river. Each suite has a deck overlooking the winding Clarion River in the heart of Cook Forest. There is also a community deck with a fire pit. Spa treatments were offered at the Lodge for those who needed stress reduction. For us, any stress we may be feeling evaporates the moment we drive into the forest. 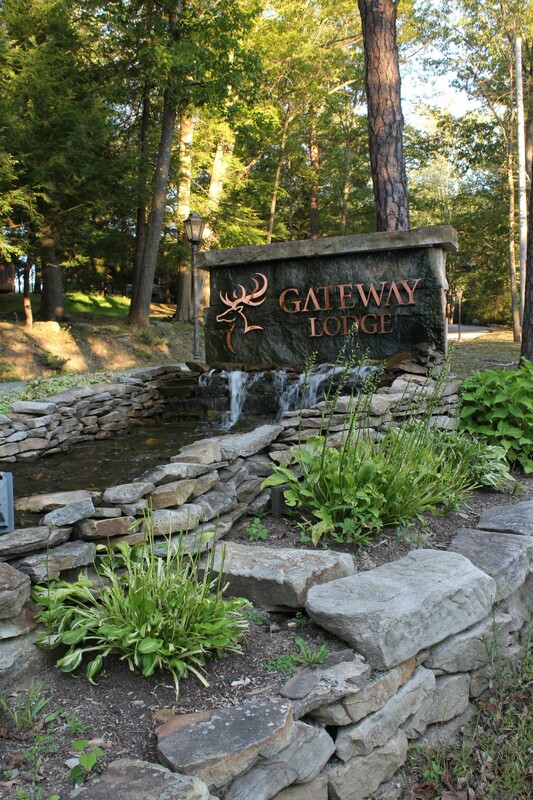 Special events take place at the Gateway Lodge in the summer seasons. The events include beer tasting, campfire nights and live music events. There is also a conference area for corporate retreats and the lodge provides an incredible venue for a wedding celebration. There are many hikes in this area. We did a few of the shorter hikes including Black Bear Trail, mostly just for the name of it. 😀 We also hiked Toms Run Trail and Liggett Trail. A lot of the trails are interconnected within the trail system, so hikers need to pay attention to trail signs. Cook Forest State Park is home to an area known as the Forest Cathedral Natural Area. This National Landmark is home to some of the oldest trees east of the Rockies. The size of the trees in the Forest Cathedral rivals many of the great forests of the western United States. 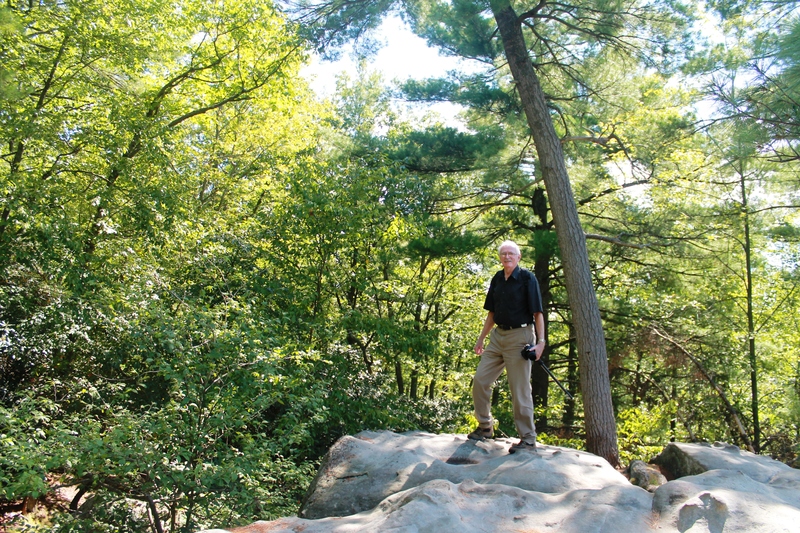 The Forest Cathedral is crisscrossed by 6.5 miles of trails, and the most popular is the Longfellow Trail. This 2.4 mile RT trail passes by some of the largest trees in the park, as well as an area damaged in a 1956 tornado. Seeing the majesty of such large trees, and understanding how natural events can destroy their domain is a powerful realization. 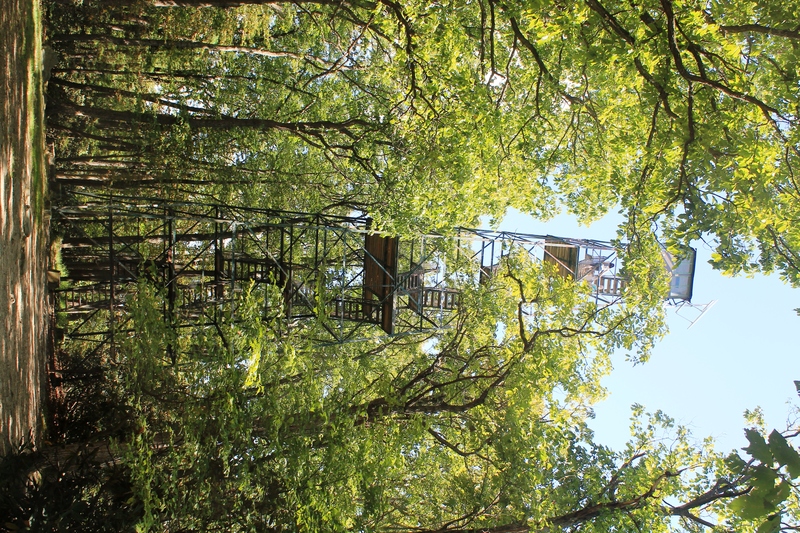 A short drive from Route 36 takes visitors to an old Fire Tower. The 87 foot fire tower was built in 1929 and provides a widespread view of the surrounding area. While the tower was built to provide a lookout for firefighters, it has been used solely as a viewing point since the mid-1960s. There is a sign posted that states there is a six person limit on the tower. When Lance climbed the tower there were 2 people and 1 dog already on the top of the tower! Visitors walk a short distance from the Fire Tower parking area to Seneca Point Overlook for a scenic view of the Clarion River valley from an elevation of 1600 feet. While standing on the rocky outcropping at Seneca Point, there is much rocky ground below you. American Indians used sandstone in the Seneca Point Overlook area to grind seeds and grains grown in the area below the Seneca Point Overlook. We were a bit disappointed to realize that the pre-trip photos of Seneca Point that we saw must have been taken years ago. The photos showed the Clarion River, but now, the area is so overgrown that the river is no longer visible from Seneca Point. Traveling through the Allegheny Forest, a visitor encounters villages like Pigeon and Pigs Ear and country lanes named Owls Nest Road and Trails End Road. It seems unlikely to discover a lovely shopping area like the Tall Oaks Store. The owners call it a magical shopping experience. There are no crowds rushing around, no food court, and this is no stress shopping! Located in a peaceful forest setting along Rt 666 in Forest County opposite the Tionesta Creek, the location of Tall Oaks Store is often called Hidden Valley. Inside the store are gift items, collectibles, antiques, prints, and unique hand picked items for which the store is known. The owners are friendly and laid back retailers who have been in business there since 1981. Known as the place where nature meets the arts, the Sawmill Arts Center is located in Cooksburg, PA. At the center there are art classes, festivals, and special events. Classes include woodcarving, pastels, watercolors and basket weaving. 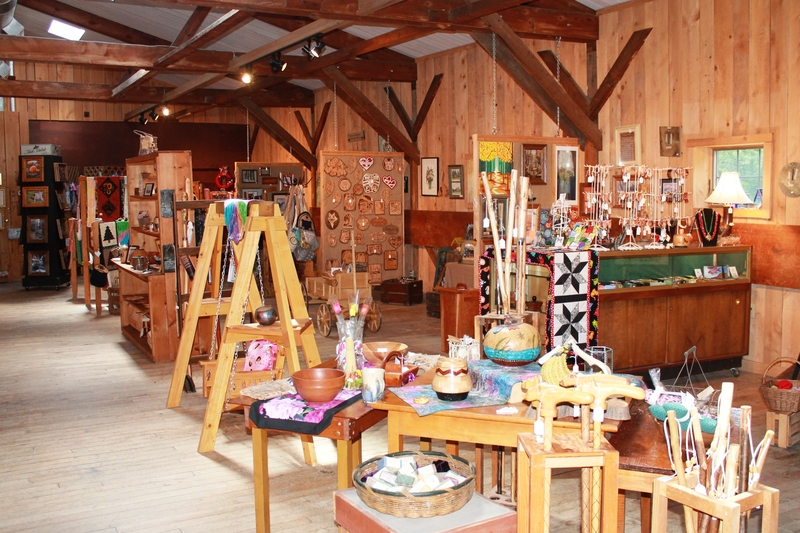 One of the best features is the Sawmill Center Craft Market. The market features unique handcrafted items, from larger furniture pieces, paintings, and fine art objects to jewelry and humorous items to tickle your fancy. The market returns 65% of the sale to the artisan to help supplement the local economy. Summer hours are 10AM to 7PM seven days a week. Just 11 miles from Cook Forest is a little gem we found along the way. Clear Creek State Park in Jefferson County has a logging history and is now managed as a “working forest”. Local state forest harvesting promotes and maintains desired forest landscape conditions while providing a sustainable flow of forest products. For visitors, there is horseback riding, mountain biking, hiking, picnicking, camping and fishing. 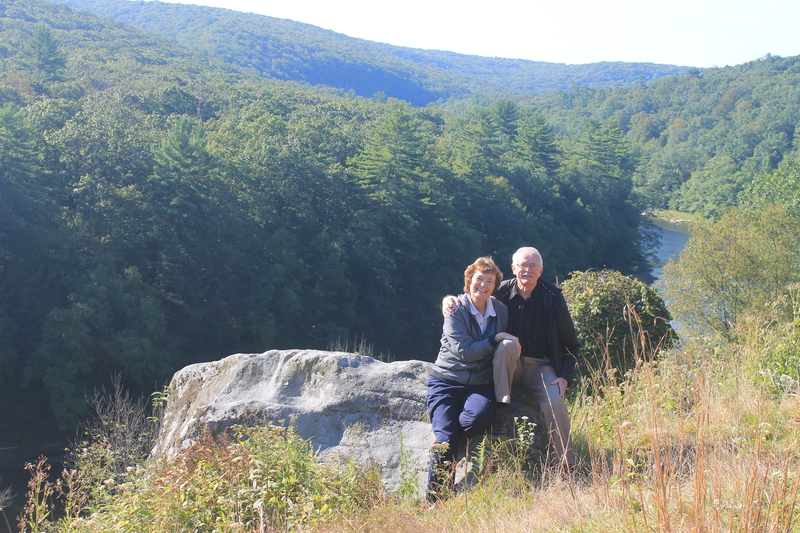 Our favorite discovery on this trip was Beartown Rocks, the best kept secret in Clear Creek State Park. This impressive collection or gigantic boulders was created by glaciers. There are multiple hiking trails in this area as well for great vistas overlooking the valley below. Located in Clarington, PA at the gateway to the Cook Forest area, the Iron Mountain Grill offers family dining, entertainment and a recently remodeled western rustic decor. On Friday and Saturday nights, groups like “Jazz Lite” and “Wheels and Heels” provide music for diners. There’s an outdoor patio, the prices are affordable and the service is good. With both indoor and outdoor seating, the Trails End Restaurant is a very popular destination in Cook Forest. Open 7 days a week at 11AM, their menu includes burgers, pasta, seafood, steaks, chicken, soup and salad. One sandwich is called the “Big Bad Wolf”. This sandwich has a fried pork cutlet, topped with ham, bacon, provolone cheese and zesty BBQ sauce and comes with fries for $8.99. Of course, Lance had to try this and took the leftovers for breakfast the next day! The Gateway markets their restaurant as “farm to forest dining experience”. The owners purchase products from local farmers, bring in “into the forest” for meal preparation. A hospitality award was presented to the Gateway Restaurant for service as “Champions of the Wild”. Rustic log tables, large sunny windows, a wood-beamed ceiling and a lovely stone fireplace serve as breakfast decor each morning for guests of the lodge. Breakfast is complimentary to guests and uniquely prepared each day. The Lodge restaurant also serves dinner Wednesday through Saturday evenings. An extensive wine list is provided from the award winning Gateway Collection of wines. Guests may select dinner choices from the Farms, Fields, Pastures and Waters menu listings. After dinner, diners are tempted with dessert choices such as Wild Blueberry Galette, Black Forest Truffles, or Zucchini Chocolate Brownie. 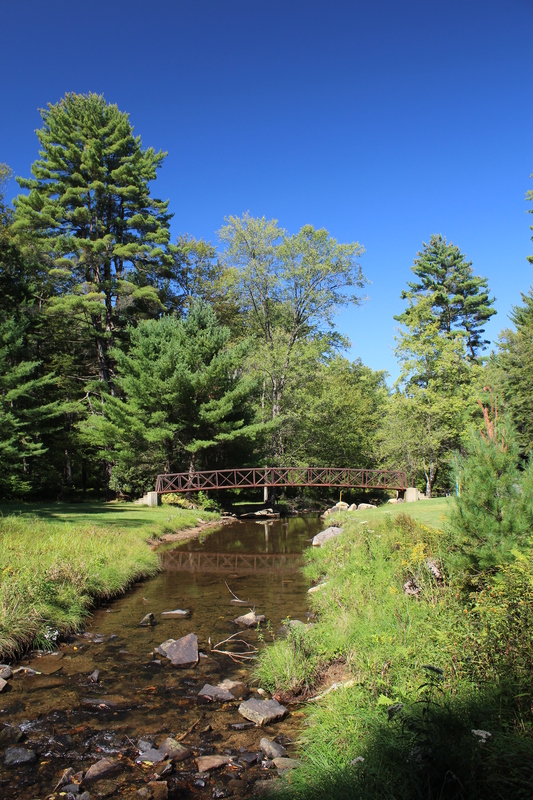 Cook Forest is the perfect place to “get away from it all”!